A friend was over the other day touring the farm and noticed the maze of black tubing that comprises our drip irrigation valves at the orchard entrance. "That looks complicated" he remarked. "You know, it's not really as complicated as it looks", I chuckled, "Did you ever play with Legos as a kid?" "Well, if you can put together a Lego set you can certainly put together a drip irrigation system"
"Do they make drip irrigation systems out of Legos?" If you have a small garden or just a few raised beds you may be asking, why even bother? I'd almost tend to agree. If you're just maintaining a small area part of the fun of watering the garden every day may be in seeing how things are growing. Kat and I started out with just a simple raised bed on the side of our first home and part of the fun was coming home from work, watering the garden and seeing how much things grew. But let's say you've moved on to a larger plot and watering during the hot summer months becomes more of a chore than a pleasure. Taking some time to setup a simple drip irrigation system will pay for itself time-wise in short order. Why else? 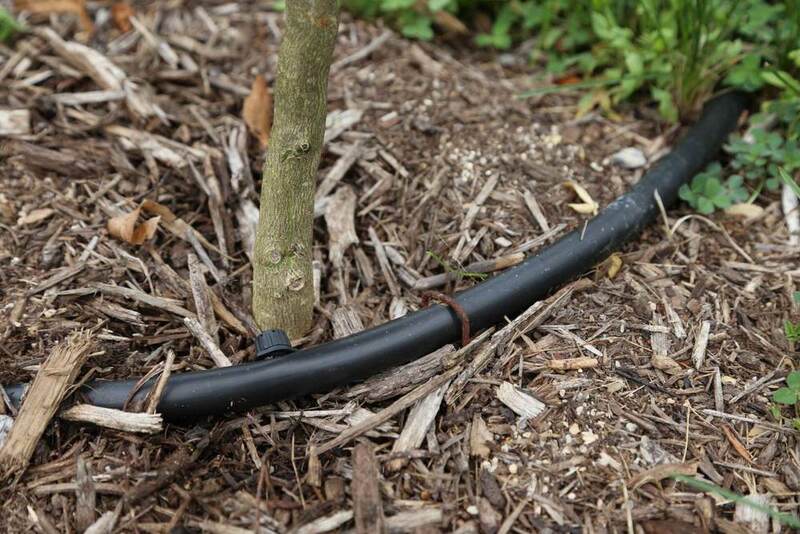 Drip irrigation can help reduce water-related foliar diseases by watering right at the roots. In addition, drip irrigation (versus irrigating overhead) applies the water right where the plant needs it: at the roots, so there's less waste. Properly done and with just a little maintenance, a drip irrigation system can last you many seasons and save you oodles (yes, oodles!) of time. When I first started setting up my own drip irrigation system, my first question was about getting the right parts. Thankfully, many sites sell starter kits for various types of installations: potted plants, garden beds, vegetable beds, greenhouses, and more. It takes the guess work out of an initial setup. In addition, many online retailers, knowing that this can be tricky topic, have setup tutorials to help the first-time user get a grasp on the fundamentals. See a few links below for some great articles and tips to get started. Starter kits along with tutorials were a great help in understanding all of the pieces that need to be in place for a system to work properly. With this knowledge in hand, I ordered my first drip system kit and then added other parts I thought I'd need based on the number and type of plants I was trying to irrigate. Did I get everything right? Nope. But the good thing is that irrigation parts are typically pretty inexpensive so you typically won't break the bank. Plus, it's good to have any extra unused parts around in case you expand your system in the future. At our current Threefold Farm location, we're fortunate to be on a good well that supplies 3-4 GPM (gallons per minute) at the hose spigot. Not a huge flow by any means but sufficient to water a pretty large areas at a time with drip emitters. We've divided our system into several zones that come on at set times throughout the day. Since this well also provides water for our house, we have these turn on mostly during the night when we're not using water in the house. We've used a variety of different types of drip emitters for different applications over the years. Some we've come to use through trial and error, others come about through seeing what different nurseries and orchard use and trying out the same here. It seems that every year we learn a little something new or come across a type of emitter we haven't tried before and decide to give it a go. Here's how we handle the various types of drip irrigation we have setup here. For smaller potted plants (< 2 gallons) we rely on drip stakes and button drip emitters. The setup is simple and allows us to accommodate very small pots on up to 2 gallon pots. We do this by placing a 2 GPH pressure-compensating drip emitter on our 1/2" supply line, then split it either 2 ways or 4 ways. For the smaller pots we use the lines split 4 ways, for the larger pots we use the 2-way split lines and sometimes stick 2 emitters in one pot. Closeup of one of our drip stakes caught in the act! For larger potted plants we exclusively use product called Spot Spitter. These are very economical (less expensive than the drip stakes when you factor in the button emitter and splitter) and do an excellent job with larger pots: 2 gallons on up to 50 gallons. They could even be used on larger pots but I'm thinking you might want more than one spot-spitter per pot. Spot spitters are rated by the GPH that they output and the type of spray that they put out (narrow versus wide). Both of these types of emitters have worked really well through multiple seasons and even sit out in our cold winter weather with no adverse effects, though they'd probably last longer if I stored them in a sheltered location for the winter. 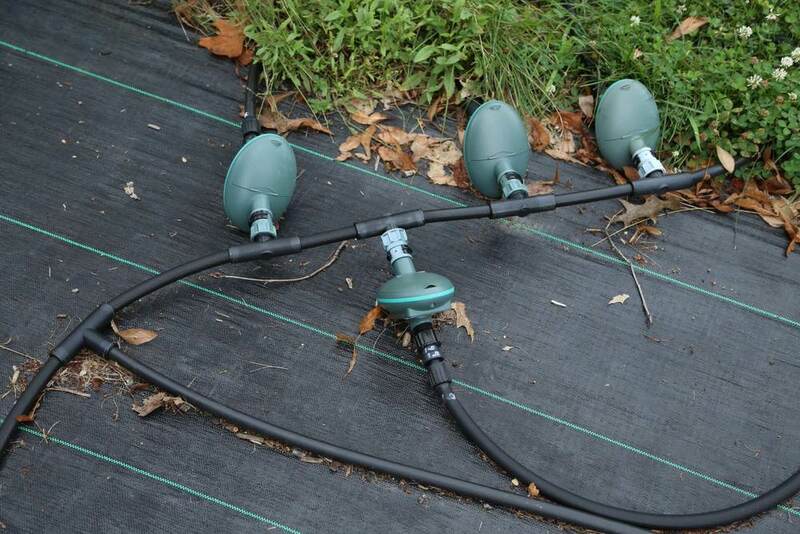 In our vegetable beds we've gone through a couple different types of drip emitters. Starting out we used soaker hoses. These are 1/2" hoses that "weep": water drips out along the entire length. These worked well when we had just a few beds, but became somewhat impractical for larger-scale watering. In addition, the hoses put out a lot of water, so it would have been impossible to water a larger number of beds at a time with this approach. We’ve now switched to using ¼” dripline. This flexible tubing has drip emitters inserted at various spacing with various flows. We’ve found that for what we’re growing, the 6” spacing of 0.5 GPH drippers works well. If you’re exclusively growing larger crops, 12” or even 18” spacing may work well for you. We rotate crops in and out of our beds so we wanted a universal spacing, and 6” seems to work well. Dripline (as well as drip tape) is also available in ½” diameters and would be good for long rows of crops. We prefer to use ¼” because it’s more flexible. Dripline is used in more permanent installations while drip tape is typically replaced every season. One thing to note is the length of the ¼” dripline runs. With 6” spacing @ 0.5GPH our runs of dripline off of the main ½” line are limited to about 30’. Any more than 30’ and you’d begin to see a dropoff in drip output as the line simply can’t handle the water output. 30’ works well for our 4x12 beds and we can lay out the tubing quickly and easily to accommodate whatever is planted. Quarter inch dripline along with a microsprinkler for seedlings. I don't highly recommend this particular microsprinkler since it seems to clog easily. In an orchard or other tree-row planting simplicity and cost are major factors. Runs of dripline can be in the hundreds of feet. Tree rows are typically kept mulched or left as bare ground to reduce competition and give the tree the advantage over groundcovers. If some dripline is hit by a tractor you want repair to be simple and cost-effective. Therefore I’d recommend using ½” dripline for watering. Depending on the length of run, available water pressure, tree spacing, and the needs of the particular tree you’re growing, drip emitter spacing ranges from 12” all the way up to 48”. We don’t employ any ½” dripline for tree crops here, but I’ve seen it used in commercial orchards for a variety of trees and bushes planted in long rows. A typical garden bed is likely to have a mix of flowers, trees, and shrubs. In our own orchard, the same zone might water some larger trees along with a few bushes laid out in rows. For trees our current emitter of choice is the adjustable bubbler. When the tree is small the bubbler can be dialed way down to just a trickle. Once the tree is larger the bubbler can be opened up (if you’ve got the pressure!) to soak a larger area and account for the increased water needs of the tree. In a mixed planting, try to plan out the run of your main irrigation line and account for the different types of plants beforehand. For instance, one of our irrigation runs consists of mostly trees but also a few blueberry bushes laid out in rows. For the trees I went with adjustable bubblers then branched off the main line to run ¼” dripline (6” spacing, 0.5GPH) to the blueberries. For a commercial orchard this type of mix and match (read: haphazard) approach may not be a good idea, but it works well in our small orchard. A bubbler at the base of our trifoliate orange. A controller for one of our automated zones. You could also insert a manual ball valve if you'd like to control watering manually. All of our watering would not be possible without the use of individual watering zones. We simply don't have enough water pressure to water everything at once. Zones are a way to split up the plants you water into groupings. See our zone spreadsheet above for an example of how we’ve split up ours. Have a lot of plants and not sure how to split up your zones? 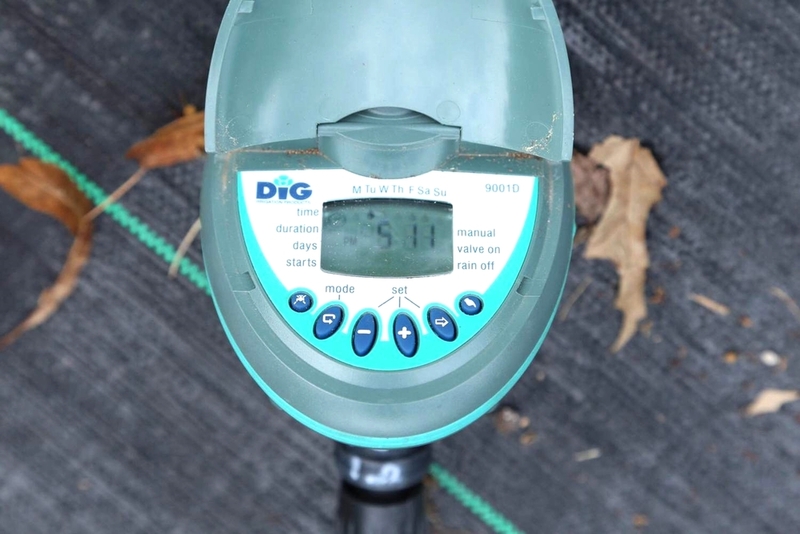 Do some simple math before laying out your irrigation setup to determine how much water you want to put out to each plant over the time that you irrigate. Example: Our well produces about 4 GPM or 240 GPH. Therefore in ideal conditions I can run 240, 1 GPH drip emitters off of a single watering zone. Or I could also run 120, 2 GPH emitters off of the same zone. Or approximately 240’ of ¼” dripline (assuming 6” spacing @ 0.5GPH). Adjustable bubblers throw a wrench into the mix but make some estimates assuming the bubblers will be halfway open (most give a range of output in their specs). The lower the output of the drip emitters you choose the more emitters you can have in a particular zone, but be aware that lower output emitters will cover a small amount of ground versus wetting a larger area with a higher output emitter. Watering is one of the most critical factors in establishing new plantings. In order to make things easy on ourselves all of our watering is set to run automatically on a schedule. How is this done? Well, we currently have this setup through battery-powered hose-end timers. These timers are built to run on a user-defined schedule all growing-season long on a single 9V battery. How do they work? Pretty well. Our timers typically last us 2 years since they sit exposed in the sun all summer and are exposed to storms and rainy weather. They’ve been reliable enough to keep our potted plants alive and thriving through a few seasons, though we have had them quit on us mid-season. They’re easy to program and flexible enough to accommodate a variety of watering schedules: 3x a day for the potted plants, 2x a day for the vegetables, a few times a week for the trees and bushes. I’d recommend watering everything really well and pretty frequently the first year, then backing off in subsequent years as the plants become more and more established. Regular watering will help the plant to grow to producing size more quickly and reduce stress on the plant. Fruit will also tend to be larger. We start off with watering 3-4x a week then will back off to 2x a week once things are established. A happy, healthy row of figs on drip irrigation. Notice the growth even after a very harsh winter! In the future, we plan to ditch battery-operated timers for a centrally controlled system. There are irrigation controllers now that can be controlled over the internet and via mobile devices. It should be rather simple to convert our existing system to a centrally-controlled one in the future. Look for another article if we do! All of our plants love the regular watering they receive via drip irrigation and the plants respond with tremendous growth. For our potted plants, this means that they also want a lot of nutrients or they start to yellow. We try as much as possible to incorporate necessary nutrients into the soil mix but sometimes it doesn’t keep up with growth. Enter fertigation (fertilizing + irrigation). Fertigation allows you to fertilize your plants while you irrigate. By using water soluble fertilizer and a fertilizer injector, a small amount of fertilizer can be added to the water so that the plants are fed and watered at the same time. Currently we fertigate just our potted plants because it’s a controlled environment and the plants can’t seek out nutrients as easily as they might in the ground. Water soluble fertilizers are available with both organic and conventional options. Do you have irrigation setup on your garden? Got any advice to share? Let us know in the comments!